DUNVEGAN - Autumn is here! What better way to welcome it than with a festival, one that celebrates the heritage of a region plus the ingenuity and perseverance of its people, past and present. Just such an event is set for Dunvegan this Sunday, September 25th between 11:00 a.m. and 5:00 p.m., when the Glengarry Pioneer Museum holds its Harvest Fall Festival. New this year will be a "Horse-Power Parade" through the streets of Dunvegan at 1 p.m. featuring horsedrawn buggies, carts, farm implements - even a horsedrawn delivery wagon - as well as riders on horseback and some gleaming vintage automobiles. Leading off the parade, which winds up on the Museum grounds, will be the Quigley Highlanders Pipes & Drums led by a flag-bearer carrying the old Union Jack of pioneer days in Upper Canada. There will be a Giant Harvest Sale Tent where donated garden produce, perennials, dried flowers, jams, pickles, as well as baked goods may be purchased. All proceeds from the Sale Tent go toward Museum projects. Last-minute donations from your garden or kitchen would be most welcome. As an added bonus, this year the Scotiabank in Maxville has generously agreed to match monies raised by the Harvest Sale Tent, dollar for dollar. Not to be missed is that trademark of the Fall Festival: the Great Zucchini Contest, with its prize categories for largest, smallest, and best-dressed (or costumed) zucchini, and best recipe. Three official tasters will be on hand to sample the dishes. 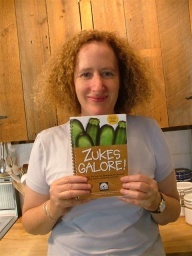 Also this year, the Museum's brand-new cookbook: "Zukes Galore!" is being officially launched during the Harvest Fall Festival. Among the interpretations of pioneer life, crafts and artisan stalls on the grounds that day will be demonstrations of ice cream and butter-making, a full blacksmithing demonstration, horse-shoeing, canoe-building, and the making of leather boots, shingles, rope, tinware for the pioneer home, and a variety of practical, decorative wooden wares. An organic garlic grower will be there, as well as craftspeople demonstrating stained-glass techniques, quilting, weaving and spinning, rug hooking, jewelry and gold-work, and even art works executed in cement. Of special interest to youngsters will be the barnyard petting zoo, hay wagon rides, demonstrations involving the use of horses, as well as other children's activities throughout the day. This being a "fun day" for all ages, there is no admission charge for the Harvest Festival. Families who pack a picnic basket, and show plenty of "sales resistance" in the face of delectable foods and handicrafts, can spend the whole day at the festival without spending one penny! However, for adults wanting to make a voluntary contribution, a suggested donation of $3.00 would be greatly appreciated. The Museum is located in Dunvegan on Greenfield Road (County Road 30), at the intersection of Dunvegan Road (County Road 24). Due to bridge construction, County Road 24, west of the village, is currently closed at the Scotch River. Therefore, visitors approaching from Exit 51 off Highway 417 should take Stewart Glen Road (just before the Esso) and follow it until it ends at County Road 30. A right turn will then lead them past the church and into the village. For further information, visit the website http://www.glengarrypioneermuseum.ca or telephone the Museum at (613) 527-5230, leaving a voice message if necessary.